Rental contracts are written documents for officially and the legally binding relationship between landlords and tenants. They have importance because of the fact that they identify the premises, landlord, tenant, rent, terms, and conditions. Thus, this information needs to be carefully documented. 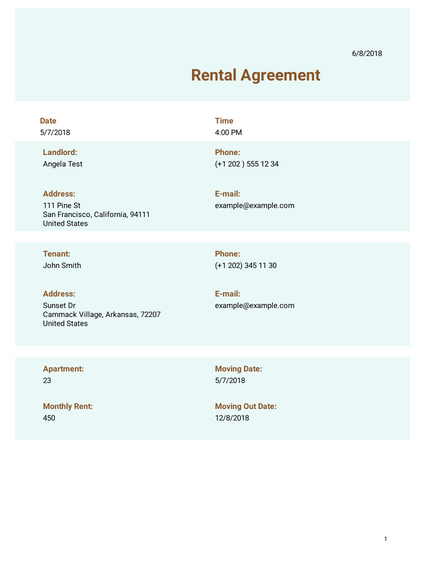 Here you can find both simple and well designed Rental Agreement form and PDF templates you can use for collecting necessary information and turn the online rental agreement form to a contract document. Just try them now for free you will see that these templates will make your business easier more than estimated. Plus, you can edit these templates the way your business requires. In hac habitasse platea dictumst. Aliquam augue quam, sollicitudin vitae, consectetuer eget, rutrum at, lorem. Integer tincidunt ante vel ipsum. The contents in this page and FAQ are intended to convey general information only and not to provide legal advice or opinions. You are encouraged to contact an attorney for advice on specific legal issues.